I’ve been trying to cook lighter lately, and sometimes that can be challenging when cooking for a man too. Both John and I love mushrooms, but they are usually “in” something. This time, I decided to make them the star. This dish is incredibly simple, with fresh, clean ingredients. The meaty mushrooms are hearty and filling, and the fact that this dish is primarily vegetables is pleasing to the health-conscious individual. I’ve included directions for a simple garlic pasta, but there are many things that would pair well with these mushrooms, or even use younger crimini mushrooms and serve as an appetizer. Arrange mushroom caps upside down on a lightly sprayed baking sheet. In a medium bowl, combine remaining ingredients, adding salt and pepper to taste. Mound the filling into the mushroom caps, distributing evenly. Try to use all the filling, it will cook down quite a bit. Bake for about 25 minutes, or until heated through and golden brown. Cook angel hair pasta according to package directions. In a saute pan, cook garlic in olive oil on medium heat until golden brown. Toss pasta and garlic oil together and salt to taste. Serve immediately with hot mushrooms. Turn oven to 375 degrees. 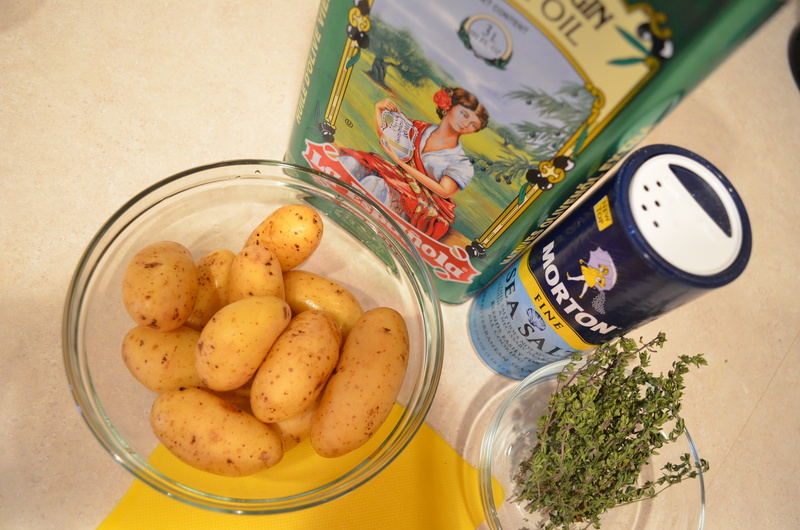 Cut the potatoes in half length wise, toss with olive oil in a bowl, add thyme and toss again to coat evenly. Add the salt and stir. 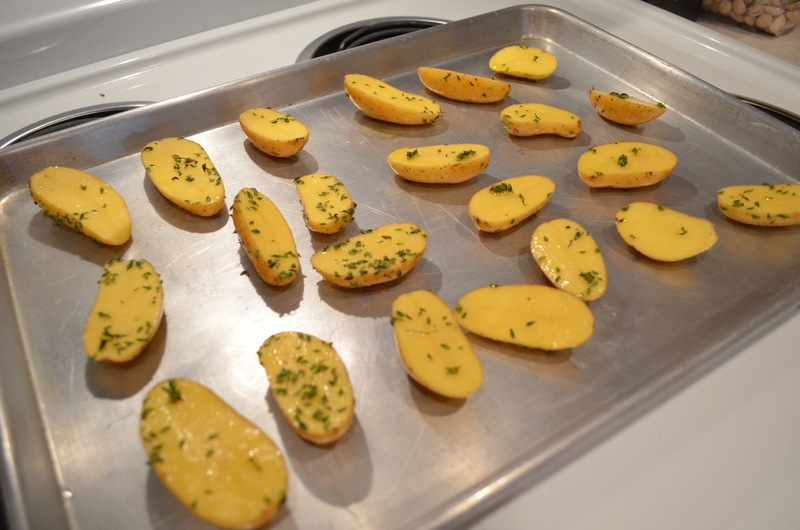 Lay the potatoes skin side down on a baking sheet and bake in the oven for 15 minutes or until tender. 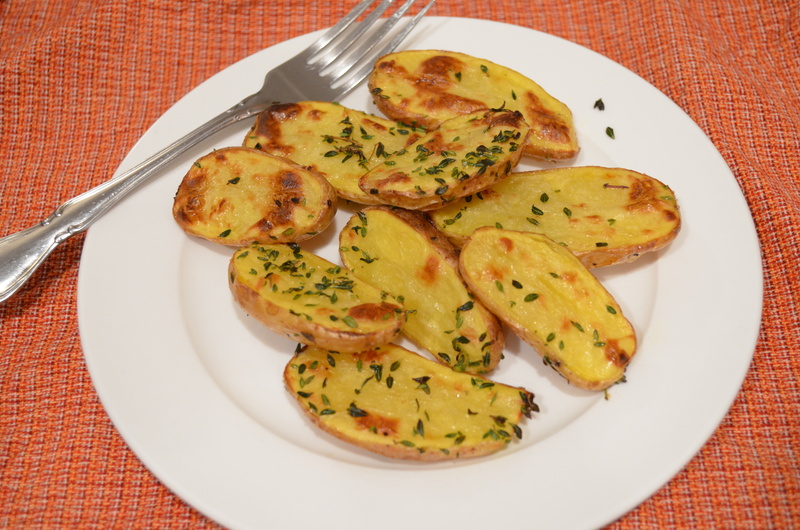 Turn oven to broil and cook potatoes for an additional 2 minutes just to brown and crisp them. Remove from oven and cool slightly. Enjoy. Toss all ingredients into a food processor and puree, OR use an immersion blender. 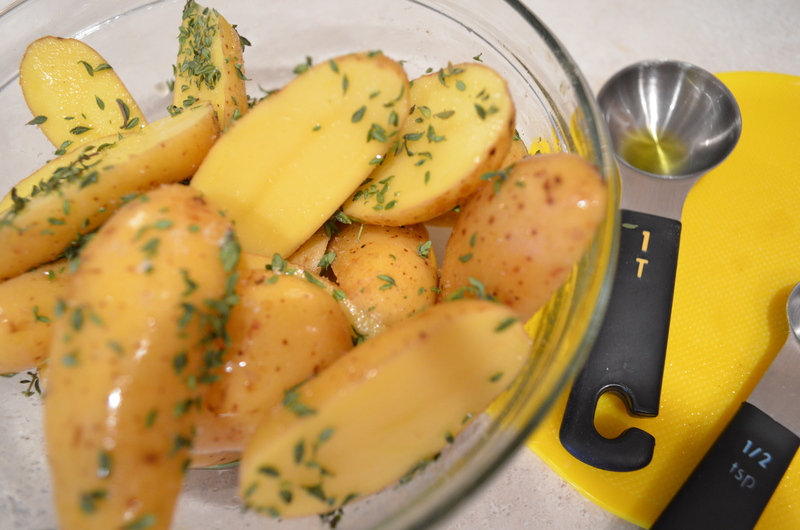 The immersion blender takes a little more time and patience, but it works out. Taste test it to make sure you have it how you like it. Fill a clean ice cube tray with the sauce and let freeze overnight. Once frozen, pop those babies out, throw them in a ziplock and store them in the freezer. The small cubes make thawing a cinch, and you now can add that fresh cilantro taste to any dish.